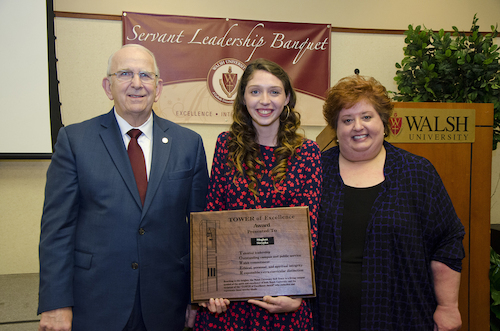 Walsh University seniors Meghan Skrypka and Jacob Turner were honored on Sunday, April 7, with the top two awards the University bestows its graduates -- the Tower of Excellence Award and Outstanding Student Award. 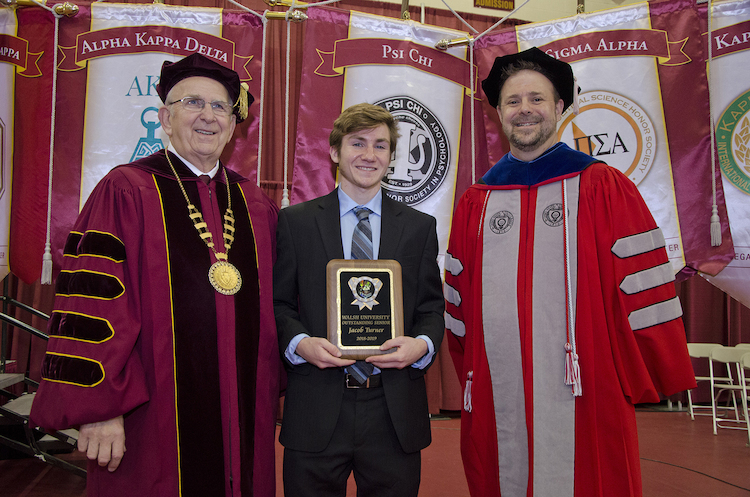 Walsh recognized the academic and personal achievements of its 2019 senior class, faculty and staff members during two special events on campus, the Annual Honors Convocation and the Servant Leadership Banquet. The Tower of Excellence Award is Walsh University's most prestigious and longstanding honor that a Walsh student can attain for work and service beyond the classroom. This year's recipient, Meghan Skrypka, will graduate on April 28 with her degree in Environmental Science - Analytical Chemistry and Applied Biology, and a minor in Government and Foreign Affairs. The Outstanding Student Award, Walsh's most prestigious academic honor, is awarded to a graduating senior with a high cumulative grade point average, a record meeting rigorous challenges, and demonstrated ability to apply intellectual mastery. This year's honoree, Jacob Turner, will graduate this April with his Bachelor of Science Degree in Biology. Tower of Excellence Recipient Meghan Skrypka has consistently demonstrated a strong commitment to the values of Walsh University through leadership and service. During her educational career at Walsh, Meghan earned a cumulative 3.37 GPA while pursuing her Bachelor of Science Degree with a double major in the Environmental Sciences Analytical Chemistry and Applied Biology, with a minor in Government and Foreign Affairs. Her hard work as consistently earned her Dean’s List Honors. As a member of the prestigious Br. Francis Blouin Global Scholars Program, Meghan participated in two global learning trips while at Walsh. She visited Uganda in 2016 to study entrepreneurship and technology in developing countries and Rome in 2018, where she and her fellow Scholars studied the impact of the Roman aqueducts on water-related technology. Meghan has held research assistantships at Walsh University focusing on microbial fuel cell research; with the Nimishillen Watershed Water Analysis Project; and as a lab technician testing community soil samples as part of a grant awarded to Walsh. Meghan is a proud member of the Walsh University women’s lacrosse team, where she and her teammates earned GMAC Academic All-Conference team honors for 2017-18. Meghan has also served on the Walsh University Student Government as the Sustainability Commissioner and Student Government Representative since 2017, a member of the Walsh CAVS callers since fall 2016; a member of the Student Alumni Association since 2017, and a member of the Walsh University Tree-USA Advisory Committee. Following graduation, Meghan will be joining the Ecological Sciences and Engineering Program at Purdue University’s School of Agricultural and Biological Engineering. During his educational career at Walsh University, Jacob Turner has earned a cumulative GPA of 4.0 while pursuing his Bachelor of Science in Biology, Pre-Med. He attended St. Joseph High School in South Bend, Indiana, where he graduated as a St. Joseph Scholar. At St. Joe, he was a member of the National Honor Society and part of the Track and Field and Cross Country teams. Jacob was drawn to Walsh University because of its Catholic faith and excellent reputation in the sciences. It was his time at Walsh that confirmed and grew his interest in medicine. Jacob has been active on campus as the Catering Chair for the Walsh University Dance Marathon for the past two years to help raise money for Akron Children’s Hospital. During his summers in Indiana, he has volunteered for the Muscular Dystrophy Association and the St. Joseph Regional Medical Center in the Post Anesthesia Care Unit and the Progressive Care Unit. At Walsh University, Turner has continued his running career as a student-athlete on the Cross Country and Track and Field teams as a distance runner. He was a member of the 2017 and 2018 National Qualifying Men’s Cross Country teams and received the Walsh Men’s Cross Country Coaches Award in the fall of 2017. Since the age of 14, Jacob has played the bodhrán (Irish Drum) with the South Bend Irish band called Kennedy’s Kitchen, playing locally and regionally at festivals, pubs, and other events. He also works as a service clerk at Martin’s Super Markets. His other interests include listening to music, spending time with family and friends, and reading. His faith is extremely important to him, and his faith is the basis for many of the decisions he has made in life, including his professional career choice of medicine. Following graduation, Jacob looks forward to attending medical school, and hopes to eventually give back to others as a physician.